We're glad to introduce you our new product - ZennoProxyChecker! ZennoProxyChecker is a proxy checker from ZennoPoster that is released separately now. It's much more powerful than before! ZennoProxyChecker previously was a part of Zennoposter and it's daily used by housands of users. It's known as one of the best tools for proxycheking. ZennoProxyChecker has powerful system for using PC or sever resources for best performance. That allows to run checking process in thousands of threads at a time. 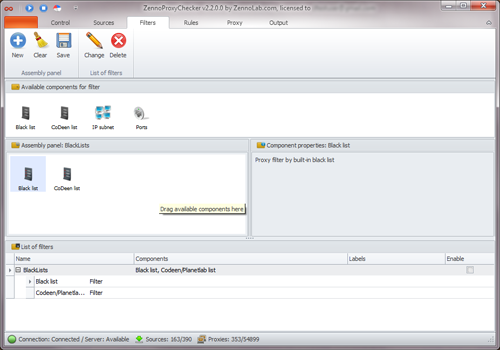 We developed special database for ZennoProxyChecker . It allows to store more than a million proxies and that will not affect overall speed of the program. It can check proxies according to 20 parameters sorting out the most dangerous and selecting the best and fastest. You can choose what parameters you want o check. ZennoProxyChecker can perform very fast check proxies for Google support (especially useful for scrapebox and hrefer) you can manually change search queries or testing and use inurl:, intitle: and others. As a result you will get different statuses: banned, captcha и passed. With ZennoProxyChecker you can set rules for output: either automatically save lists by to hard drive, either use in-build http-server and get proxies via request to localhost.